Scott's of Wisconsin has a cheese spread for every occasion and every palate. Our convenient sizes range from a 2 ounce snack size to a 3.75 ounce container with more than enough to share. The list of our cheese spreads reads like a menu of the best cheeses and herb flavor combinations possible. Not only are these combinations fantastic on breads, cheeses and vegetables as a dip or spread but Scott's cheese spreads also give your recipes an added zing of flavor. Amplify any dish that calls for cheese by replacing plain cheese with one of our exciting flavored spreads. 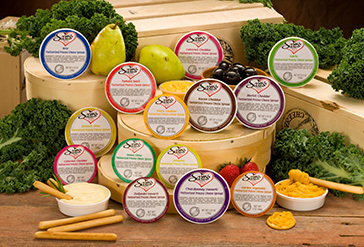 Scott's of Wisconsin always aims to please the customer, to this end, we are able to adjust the size of our Cheese spreads to best suit your needs. We customize because it matters to you.